Combined heat and power (CHP) or cogeneration has significant potential in the brewery industry. Electricity and heat recovered from a gas engine can be deployed at high efficiency for useful onsite use. 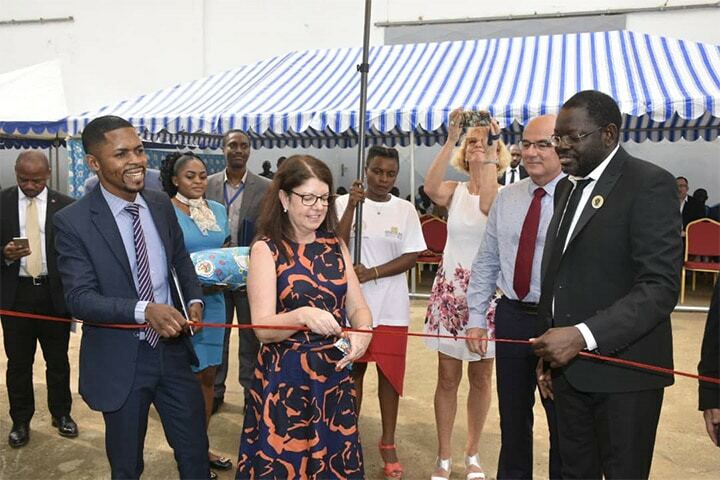 This gives the ability to reduce operational costs and reduce carbon emissions. Converting the heat into cooling via absorption chillers is called combined cooling heat and power (CCHP) or trigeneration, and can be deployed to support the cooling requirements of the brewery. Environmentally friendlier - Less fuel burned per MW generated at lower CO2 emissions. The brewing process comprises three major processing stages, namely the brew house (grey), storage & fermentation (green), and bottling (blue). The processing steps within these stages require energy, in the form of electricity, heat or cooling. 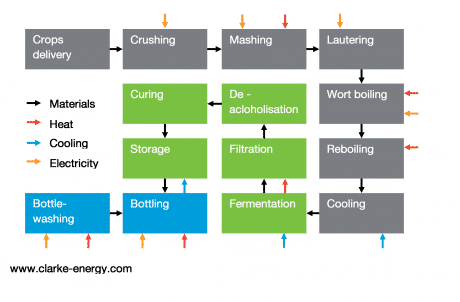 The processing steps of wort boiling and bottle washing require more than half of the thermal energy needed in breweries. Electricity is used for refrigerating purposes in storage and fermentation. 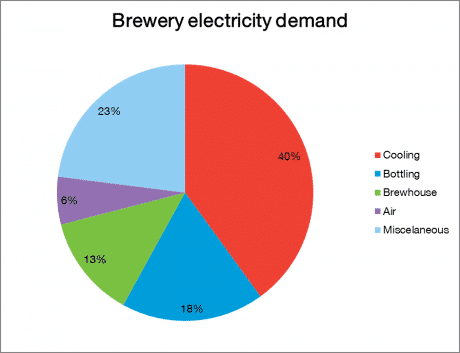 The figure below illustrates the energy demand, both electric and thermal, in breweries. Since the temperatures of CHP thermal discharges range from 45°C to about 180°C (exhaust gas), large potential arises from low temperature heat consumers, such as bottle washing (90°C) and filtration. 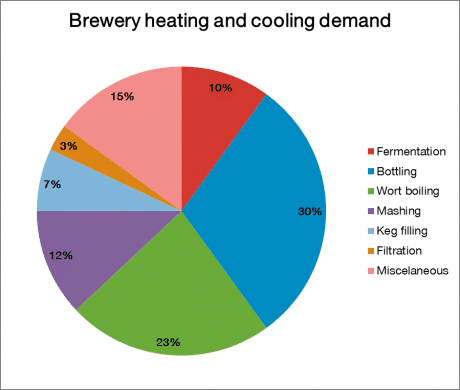 Two main criteria positively affect the efficiency of CHP facilities in breweries: A larger number of low temperature processes and a constant heat and/or cooling demand. High energy renewable biogas can be created from by-products of beverage production and wastewater treatment. Instead of considering them waste, they can be converted into electricity and thermal energy to be used in your process, significantly cutting operating expenditures. CHP also reduces your electricity costs. Depending on your country‘s legislation, you can further benefit from governmental CHP funding. Although not every brewery requires sufficient heat to operate a CHP facility for their production, CHP can also be financially beneficial for smaller companies such as craft breweries. 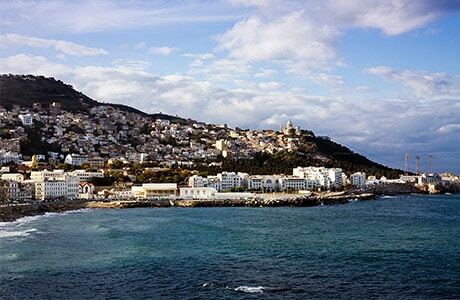 Since many also offer hospitality, the combined thermal demand of brewery and guest rooms serves as heat sink of the CHP plant. Thereby, separate sources of thermal energy for production and domestic heating become obsolete. To learn more about data centre CHP or for us to evaluate your project please submit your enquiry here.